It’s nearly Halloween. Wh-ooo! Earlier this month, I went on my very first ghost tour, courtesy of the Roswell Ghost Tour in Georgia. 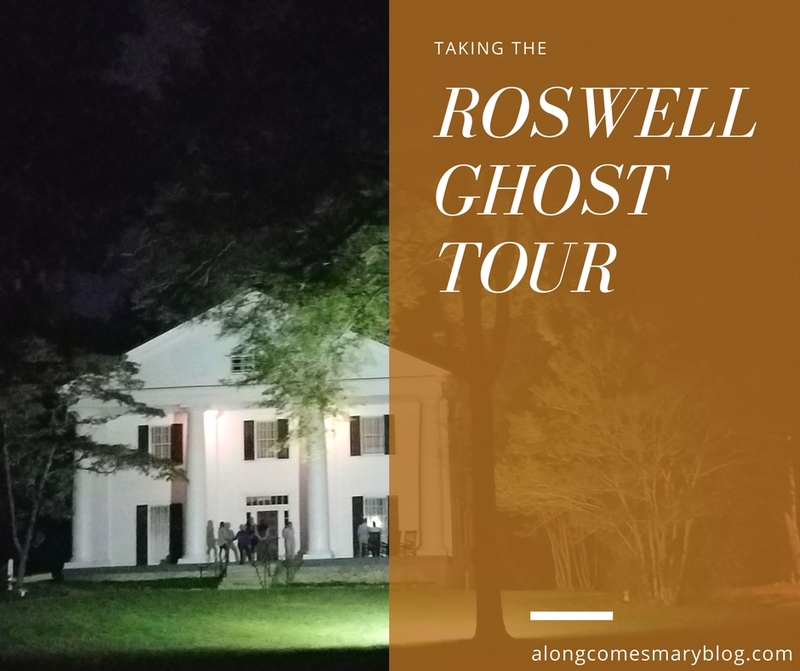 Having definitely felt like ghosts are around and being a fan of hotels with resident ghosts, I knew that the Roswell Ghost Tour would be intriguing, and I actually ended the tour feeling as though I knew many more of the Atlanta suburb’s locals! Held year-round, the ghost-ly excursions are the brain child of Joe and Dianna Avena. Both long-time residents of Roswell, the couple’s interest in ghost hunting does not stop with their often sold-out tours. They are also the founders of Roswell Georgia Paranormal Investigations and have appeared on Sci-Fi’s Ghost Hunters. Your tour begins at 8pm with meeting up with your group and evening tour guide at the gorgeous Roswell Town Square (I just introduced you to their picturesque park in my last post). On our chilly evening, I had heard much about the horrible “heat wave” Georgia was in the midst of, and that afternoon had been nice and warm. So, like a fool, I wear my Capri jeans. Do yourself a favor and wear pants! My hoodie alone did not cut it, and it definitely got brisk. Meghan would be our tour guide for the evening. A Roswell resident most of her life, Meghan’s fascination with the paranormal traces back to her childhood; her Mom was an insomniac, and would be up late into the night listening to AM radio favorite, Coast to Coast. As she heard countess listeners calling in with their stories and experiences, it sparked young Meghan’s interest. She has a wealth of knowledge about the lives of past Roswell residents, and is quite the historian as she explained tales from the Civil War-era. 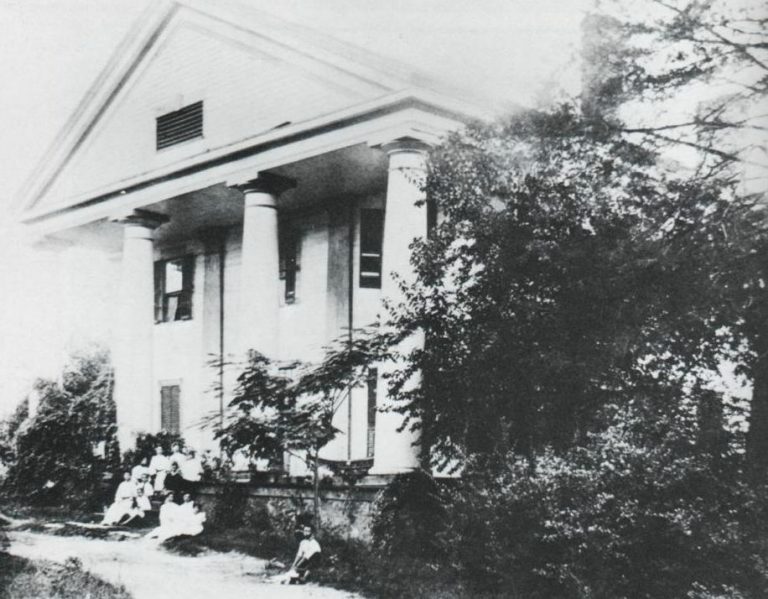 When we arrived at the Bulloch Hall, we learned about the seemingly innocent rocking chairs on the front patio. Apparently, many people have felt someone is pushing them out of the 3rd chair in, to the right. I sat in all 3, and no one seemed to mind. In the back, there is a rather creepy (in the dark, anyways) well from the 1800’s that apparently a young slave girl drowned in. In recent years, the home has been known to have several lighting issues and many that flicker like crazy. Just so happens that young girl was responsible for the lighting in the home. Bulloch Hall. Photo: Roswell Ghost Tour. Call me crazy, but, we were each given a flashlight for our tour and mine FLICKERED like mad most of the night. Was she saying she was there? When we moved on from Bulloch Hall, we got to take a glimpse of Jimmy Carter’s Aunt Sissy’s home, and where the President announced his campaign in 1976. The locals knew Aunt Sissy’s home as “Carter’s Roswell White House.” Just across the street from Sissy’s home is another infamous said to have some ghosts not afraid to stand their grounds. A soldier has been seen, as well as a nicely dressed home staff member (most say looks like a butler) who often makes sure the driveway gate is closed. Over the course of our nearly 3 hour walk, we covered much of this historical city. Did it ever feel creepy to be walking these dark streets at night, with not much more than a flashlight to guide your way? A little. I found it more exhilarating to see these landmark mansions in the late hours. I had my IFWTWA group and Meghan to protect me, too! Having just eaten lunch at the Mill House, we returned to their multi-business building to hear that they are not just serving up some of the best food in town. They might be serving ghosts, too. While there have been problems of owners constantly coming into their space at the plaza to find it drenched in water and destroyed, there is also said to be a rather sly guy who enjoys flirting with the ladies and peeking out the window onto the parking lot. The most eerie story of the night we heard had to be at the old apartment buildings where many of the mill workers lived. Not only is there Fred, a Confederate soldier who is known to throw parties and get very disgruntled if his soirees are disturbed, but another story concerning another little girl. While she’s been spotted down the street from this complex at a local park and in her Sunday best, her most infamous story occurred when a group of school girls a few years back in junior high were in front of this building; learning about its ghostly history. Apparently, the young ghoul girl skipped back and forth in front of these young ladies when she suddenly jumped at them abruptly. Sending the group screaming and running up the street for their lives. It was then that the Roswell Ghost Tour enforced waivers to take their tour. Can you blame them? Town Square in 1939. Photo: Roswell Ghost Tour. As you let that tale sink in, Meghan guided us up the street where we would be concluding the tour (returning back to the Town Square). Looking across the street at the Public House, it seems that quite the town lovebirds still reside in this building. 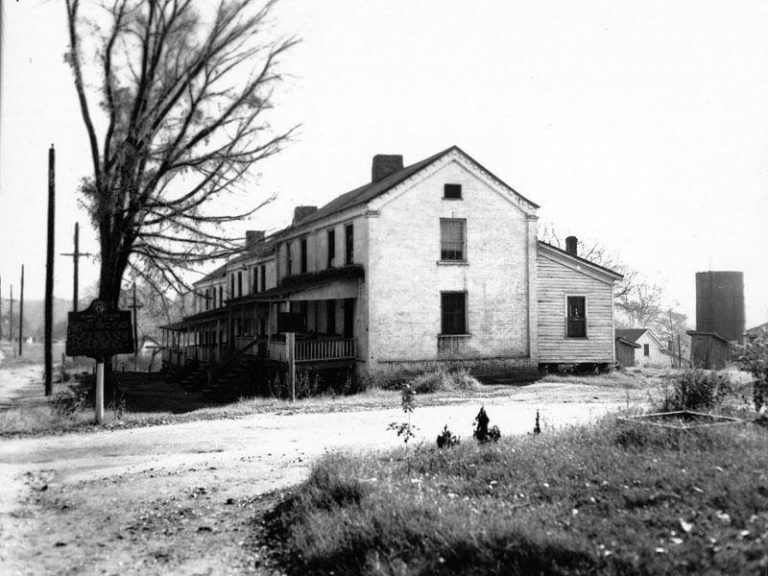 Now a small restaurant and bar, this building was a commissary during the Civil War and the owner’s daughter, Catherine, fell in love with a Union soldier named Michael. This was quite the scandal back in the day, and Michael was charged with treason and ultimately hung right in the Square. Much like a Romeo and Juliet story, heartbroken Catherine subsequently hung herself. The couple have been said to have been seen in the upstairs window as if they’re on a date. A young boy was once upstairs after using the restroom, talking animatedly to someone. When his Dad came searching for him and asked who he was talking to, the boy replied that his Father had scared “Mikey”. No one appeared to be upstairs. And, these are just afew of the haunting and mysterious stories you will hear when you take the Roswell Ghost Tour. If you go, definitely be prepared with a jacket, pants, water, and maybe even your own flash light. Good walking shoes, too! The tours can easily last 2 and a half to three hours. We definitely felt like it was a good 3 miles we walked. There are some mild hills and steps. To learn more about the Roswell Ghost Tour (and even their dog friendly night), visit them HERE.